Engines are not eligible for bonus bucks or veteran discounts. Contractors are reporting back that they are saving $1.50 per hour in fuel costs over the carbureted engines. Based on this information – using a machine 8 hours a day per wee=k will produce an annual fuel savings of around $3,000.00 per year.. Add the Electronic Idle-Down and save even more!!! 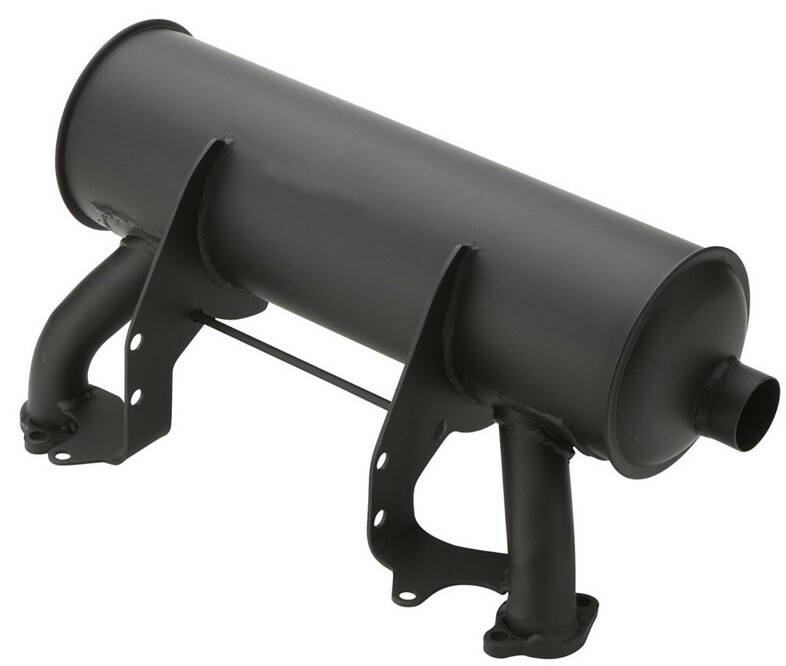 All of our engines will come standard with mufflers that exhaust on the oil filter side. When you are facing the engine (key or recoil side) the muffler will exhaust to the left. Install the engine where fresh air can be drawn for combustion. Exhaust fumes must not be allowed to accumulate in the area of operation. While these things are not an issue when the equipment isn’t in an enclosed location, units that are operated in enclosed trailers or vans run better with fewer breakdowns if these conditions are addressed. Engine exhaust can be piped to the outside of the vehicle, or the equipment can be mounted so that the exhaust pipe is pushing out an open door. When an engine is pushing exhaust out, fresh air will come into the space to replace it as long as there is ventilation to allow it. Provide an environment that will allow the engine to operate in ambient temperatures of under 100 degrees to prevent overheating. To dampen engine vibration into the rest of the equipment, rubber engine mounts are usually installed between the engine and the deck of the machine. The deck must be large enough to allow for mounting of the engine, drive system, and pump. For operator convenience the engine controls should be located at the front of the equipment. The fuel tank is best mounted in a location that will help prevent fuel from spilling on engine surfaces during refilling. Do not undersize the engine horsepower. Use the formulas to determine the minimum horsepower required to power a specific pump. Size the engine one or two horsepower more than the formula recommends. Pressure washers are generally powered by gasoline engines, diesel engines, propane fired engines, or electric motors. Force created by the power plant turns the pressure pump, which in turn moves the water. A power plant must have enough force to continue to turn the pump crankshaft when the pump is pushing water out its rated flow and pressure. The following formulas are used to determine how much power is required to drive a specific pump. The power is measured in horsepower. GPM x PSI then divide by 1457 Equals EBHP (Electric Motor) – GPM x PSI then divide by 1100 Equals Gasoline HP (Industrial) – GPM x PSI then divide by 1260 Equals Diesel HP. Regular engine maintenance increases the useful lifespan dramatically. Check the engine oil level each day. Use only clean fresh fuel. Do not allow the fuel tank to run dry. Change engine oil, spark plugs, and filters per manufacturer’s recommendations, or even more often. Use an hour meter to track maintenance intervals. Record each service on an engine maintenance log stating what was done and at how many hours. Spark plugs need to be inspected and re-gapped per manufacturer’s recommendations also. Engine repair beyond the point of maintenance requires specific information on service procedures for the particular engine. Obtain a service manual for the engine that will provide instruction on internal engine repairs. Engine rebuilding or replacement usually becomes necessary somewhere around 3000 hours on a well maintained engine. To provide some perspective on how long a period of time this is, if equated to a car driving at 60 miles per hour for 3000 hours, the car would have traveled 180,000 miles. Electric Start Problem Check to determine if the battery is dead. If so, check the engine charging system for output. Repair or replace as necessary. Inspect, clean, and tighten all electrical connects Check the starter solenoid and the starter, repair or replace as necessary Drive or pump problem? Disengage the engine from the drive system and check if it turns. Engine ceased? Run without lubrication and/or major engine component failure. Rebuild or replace. Engine turns, but won’t start. Check for fuel in the tank. Fill if necessary. Clogged fuel filter, generally engine would run poorly before actually not running at all. Replace if clogged. Remove spark plug. Examine and smell for signs of fuel. If the electrode is wet, fuel is being delivered to the cylinder, and the engine may be flooded. Dry or replace the spark plug, reinstall it and try the engine again. If the plug electrode is dry, check the entire fuel system for operation. If the engine is equipped with a fuel pump, check the pump for operation. Check for spark at the spark plug. Hold the spark plug electrode against the engine head and turn the engine. Be careful not to hold the plug on the metal to avoid getting shocked. If there isn’t any spark, it could be an electrical generation problem, a problem with low oil shutdown switch, or some other component that affects the spark production. At this point consult troubleshooting procedures in the engine repair manual. Engine Runs Poorly Replace the fuel with fresh fuel and retest. Replace or clean fuel filter and air cleaner. Change the spark plugs. Adjust carburetor settings, remembering where to return the adjustment if there is no improvement. Is the pump too much for the engine to power? If so replace with a smaller pump. Electric Start Problem Check to determine if the battery is dead. If so, check the engine charging system for output. Repair or replace components as necessary. Inspect, clean, and tighten all electrical connections Check the starter solenoid and the starter, repair or replace as necessary Drive or pump problem? Disengage the engine from the drive system and check if it turns. Engine ceased? Run without lubrication and/or major engine component failure. Rebuild or replace. Engine turns but won’t start. Check for fuel flow to the engine. Replace fuel if it is contaminated Replace the fuel filter if there is any chance of it being clogged If equipped with a fuel pump, check it for operation and repair or replace if necessary. Are the glow plugs heating properly? If not check for power to them, if no power, trace the source of the problem back and repair. If there is power to a glow plug but it doesn’t heat, replace it. Clean and inspect the fuel injectors, replace if necessary. Engine runs poorly. Check fuel quality. Replace fuel and air filters. Check and set engine RPMs to specifications. Inspect, clean or replace fuel injectors. Is the pump too much for the engine to power? If so replace with a smaller pump. Verify that the incoming power supply is on and sufficient. Make sure there are no tripped circuit breakers or blown fuses. Inspect the motor brushes and replace if they are worn out. Drive or pump problem? Disengage the motor from the drive system and check if it turns. Replace or repair the motor.